www.minnesotahockey.org is the link to the coaches site for Minnesota hockey. http://www.nationalteamsoficehockey.com/headlines.html is the link to a great international site about National Teams of Ice Hockey. Link to the Minnesot Hockey Coaching site www.minnesotahockey.org Lots of good material for coaches. Tom Molloy has coached hockey from youth to pro men and women. Tom has coached Canadian college and university for 17 years and done camps, hockey schools and seminars all over the hockey world including Korea, Norway, Finland, Austria, Mexico, Czech Republic and many places in the USA. Tom was a development coach in Salzburg, Austria for the Red Bull organization 08-09. Summer of 2010 he spent working with the hockey program in Jihlava, Czech Republic. 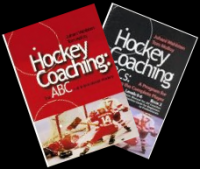 He also co authored Hockey Coaching: The ABC's of International Hockey with IIHF Hall of Fame Finnish coach and 3 time Olympic player Juhani Wahlsten. This manual was translated into German for the Austrian Hockey Association.